Location – History – Monuments: The Municipal Region of Doli includes the villages Ano Doli and Kato Doli, Kitries and Kalianeika. 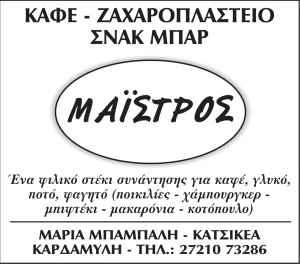 Taking the road of Kalamata – Mikri Mantinia – Avia – Kitries – Kalianeika brings you to Doli. The reddish, dry land impresses the traveller. There is lush vegetation in some places and little in others. Also the small Byzantine churches, built between the 11th and 14th century are very impressive. Aghios Nikolaos is the oldest church in the area. Aghia Paraskevi church, which has a double dome, Prophetes Elias church, Aghia Triada church, the Monastery of Aghios Nikitas and Aghios Vasileios church at the center of Kato Doli are magnificent examples of the Byzantine architecture. The area of Doli has many Neolithic and Prehistoric findings. Particularly, at the cave which is situated at the North East of the mountain Aghios Georgios at the position KotoulasΣ Neolithic as well as Protohelladika (Pre-hellenic) fragments of pottery. Kitries, the small fishing port used to be the basis of Mani Beides (local rulers). Five out of the eight Beides had Kitries as their basis from time to time; it was here that the pre-Revolution meetings took place. On the 8th March 1821 there was an Assembly of the Mani leaders of warriors and local rulers (Prokriti) where the War Committee of the Revolution was elected. The Tower of Sarava is predominant at Ano Doli. Population – Occupation: The Municipal Region of Doli numbers 375 residents (census of 1991). The main occupation of the residents is agriculture (olive-picking), home cattle breeding and fishing. 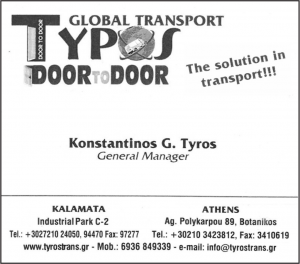 Transport – Roads – Rural roads: Doli has one bus a day from and to Kalamata while Kalianeika has a bus once a week. Kitries has five buses a day during winter but has more buses in summer due to tourism. The main road goes through populated areas, has many turns and is narrow at many parts. The area has 80% rural roads and 50% of them are in satisfactory condition. The port: The port of Kitries is small and certain works need to be done for the protection of the boats from storms during wintertime. The Municipality hopes that the projects and studies for the protection and restoration of the port will be applied to solve one of the main problems of the area. Sewage Biocleaning: Kitries have a beautiful beach that has to be kept clean. One of the prompt priorities of the Municipality of Avia is the processing of the sewage waste of seaside resorts. Water supply: The lack of water during summer months is a serious problem. 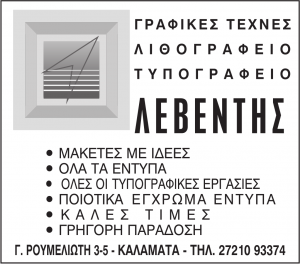 It can be solved with the joining of the water pipes with the water supply system of Kalamata. Public places – Cemetaries: There is not enough parking space, particularly during summer months. The Doli cemetery covers the needs of the village. Kitries cemetary, though, needs to be transferred to another place because it is situated at a densely populated, touristic area. Olive-oil Cooperative: Doli Cooperative is one of the first Cooperatives in Greece. It numbers 180 farmers and its financial status is very good. Education – Culture: There is a one-position Elementary school at Doli with 15 students. There is a very active Cultural Association that tries to bring together its members. It organizes festivals and cares for the development of local enterprises. 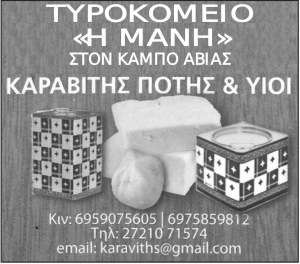 A few days ago there was the official presentation of the Lykourgos CaveΣ at a Kalamata Hotel. The original decorations of its interior, with very beautiful white, pink and red stalagmites and stalactites make it one of the best in Greece. We hope that its exploration will be over soon, so that its utilization will begin soon.